San Diego Vacation Rentals and More! With its great weather, miles of sandy beaches, and major attractions, San Diego is known as one of the best tourist destinations in the country. World class shopping, dining and attractions await guests that stay in a San Diego vacation rental from Bluewater vacation homes. Some of the most desirable real estate in the country is found in La Jolla, Del Mar and Rancho Santa Fe. These areas feature dramatic coastlines, a mild climate and spectacular scenery. 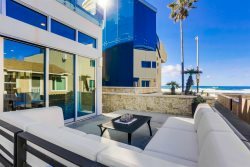 These are a top destinations for visitors to San Diego, so check out our selection of La Jolla vacation rentals and stay for awhile! Mission Beach is a stretch of beach between Mission Bay and the Pacific Ocean. Centrally located, this is San Diego's most popular beach with good reason. Bluewater has a wide selection of Mission Beach vacation rentals on the water, courts and surrounding areas. Pacific Beach is located between Mission Beach and La Jolla. Centrally located, Pacific Beach is great for surfing and swimming and also offers a wide selection of shopping, dining, and night life. Bluewater has a great selection of Pacific Beach vacation rentals on and close to the water. Mission Hills, Point Loma, Ocean Beach and Sunset Cliffs are located in central coastal San Diego are conveniently close to all of San Diego's top attractions, like Balboa Park,the San Diego Zoo, Downtown San Diego, Old Town, The Gaslamp District, San Diego Convention Center, The San Diego International Airport and spectacular beaches. For those who wish to indulge a bit, Bluewater Vacation Homes is proud to present a collection of fine luxury vacation rental homes; guaranteed to please our most discerning guests.